TBR: The Faber Edition. | Almost Amazing Grace. I really do love being a book blogger. If only because I so enjoy that tell-tale THUD on the doormat that happens every so often - a couple of times a week, these days! I am forever grateful to my pals in publishing who see fit to send me all these early editions and general goodies. It’s a real treat. The only downside...the TBR piles. Oh, the insanity. I currently have four distinct stacks of books taking up my desk - beneath my beautiful colour-coordinated shelves (courtesy of Clare, gorgeous super-organised yet wildly creative mastermind). 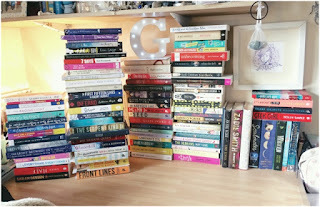 The four stacks I refer to are somewhat organised; one is for the reads I snatched up in bookshops totally independently, the second is books my friends have lent me through the goodness of their hearts, the third is the proofs and arcs I've been sent by publishers (and sometimes the actual authors!) to read and potentially review, and the fourth is...well, books I've come across and am finding a place for within the aforementioned three piles. You’ll notice in the picture above that the stacks are all nearly half my height, and precariously balanced surrounded by my bits and bobs that I really need to clear up and organise as well as I do my books…! You could make approximately one and a half Graces with these stacks. And probably at least one of my parents, the freakishly tall creatures that they are. Whereas to we book bloggers, a super-human race of our own, this is completely normal. So let’s break down some of these bad boys into a nice concise To Be Read list. I've done this before, several times, separating the TBRs into months or seasons or just general desire to read - it’s worked to some extent! This time I’ll be separating the reads into: PUBLISHING HOUSES! How thrilling and ingenious of me, I know. I recently got to spend the afternoon at the Faber offices in London, and that alone was a dream come true. Let’s now add on the fact that as well as being there, I was in the company of the most fantastical group of book bloggers - my own kind! I happily sighed walking into that room, being swept away on the smell of books and general excitement charging the air around us. I also got to meet so many of my online friends - shout-out to Luna, Chelley, Virginie & Minerva, all of whom I have chatted to on Twitter and consider good pals, but hadn’t actually seen (or hugged endlessly) in person. There were tables all set out for us - each with a plate of book-themed cupcakes in the centre, which we resisted as long as we could, honest! - and we got to see a special show of upcoming releases from this rad publisher. Two of these were Rebel of the Sands by Alwyn Hamilton and The Graces by Laure Eve. The Faber Children’s team could barely contain their excitement at getting to set these beauties free into the world (‘We rarely get two majorly perfect books AT THE SAME TIME!’). These two lovely authors (my writer/girl crushes are immense) then answered questions about their stories and Laure even treated us to a little read (her first time reading! How thrilling). Alaska, 1970. Being a teenager here isn’t like being a teenager anywhere else. Ruth has a secret that she can’t hide forever. Dora wonders if she can ever truly escape where she comes from, even when good luck strikes. Alyce is trying to reconcile her desire to dance, with the life she’s always known on her family’s fishing boat. Hank and his brothers decide it’s safer to run away than to stay home—that is, until one of them ends up in terrible danger. Like everyone else in her town, River is obsessed with the Graces, attracted by their glamour and ability to make magic. However, what if they’re not what they seem? Are they more dangerous than they let on? When given the opportunity to ask Laure some questions, obviously I had to ask ‘where did the name Grace come from?’ I couldn’t help myself. C’mon, Grace is a fantastic name. Laure then talked about how a name can be so crucial, can give you everything you need to know about a character. I agreed whole-heartedly. She then threw in that River, her main character, may not even be called River, and we may not ever know her real name...WHAT?! Oh, wow! In this exciting thriller the acclaimed and well loved author of Butter and Deadlands tells us the tale of four teenagers, the most unlikely friends, who are now fleeing the scene of a crime together. They are literally a rebel, a bully, a geek and a pariah. The question is, do they tell the police...or are they running from the police? Thank you, Faber Children’s, for the gorgeous yellow tote bag containing these delicious TBR joys. I’ll let you all know (most likely via excited tweets) how I find each one, when I finally get round to them all.